Pekcan Ertokus, G. (2018). Determination of the Colorants in Various Samples by Chemometric Methods Using Statistical Chemistry. Iranian Journal of Chemistry and Chemical Engineering (IJCCE), 37(3), 127-134. Guzide Pekcan Ertokus. "Determination of the Colorants in Various Samples by Chemometric Methods Using Statistical Chemistry". 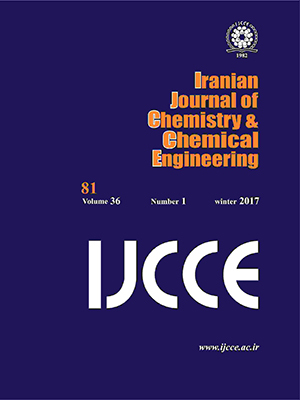 Iranian Journal of Chemistry and Chemical Engineering (IJCCE), 37, 3, 2018, 127-134. Pekcan Ertokus, G. (2018). 'Determination of the Colorants in Various Samples by Chemometric Methods Using Statistical Chemistry', Iranian Journal of Chemistry and Chemical Engineering (IJCCE), 37(3), pp. 127-134. Pekcan Ertokus, G. Determination of the Colorants in Various Samples by Chemometric Methods Using Statistical Chemistry. Iranian Journal of Chemistry and Chemical Engineering (IJCCE), 2018; 37(3): 127-134.
partial least square and principal component regression methods were applied to various mixtures of Allura Red and Brilliant Blue to determine the concentrations. Colorants, at the same time, were analyzed with UV-spectrophotometry in chemical separation. The obtained experimental data have been evaluated by chemometric methods as Partial Least Squares (PLS) and Principle Component Regression (PCR). In the first step, the synthetic mixtures containing three-color material were examined, and the obtained results were applied to the PCR and PLS. In the next step, using PLS and PCR methods, the quantities of Allura Red and Brilliant Blue in commercial beverage, samples were measured at the same time. The results were compared statistically. Capitan –Valley L., Fernandez M.D., De Orbe I., Avidad. R., Simultaneous Determination Of Colorants Tartrazine. Ponceau 4R And Sunset Yellow FCF In Foodstuffs By Solid Phase Spectrophotometry Using Partial Least Squares Multivariate Calibration, Talanta, 47: 861-868 (1998). Aktaş A.H., Pekcan. G., Simultaneous Spectrohotometric Determination of Tartrazine, Sunset Yellow and Allura Red in Commercial Products by Artificial Neural Network Calibration, Asian Journal of Chemistry, 18(3): 2025-2031 (2006). Berzas-Nevado J.J., Rodriguez Flores J., Guiberteau Cabanillas C., Villasenor Llerena. M.J., Contento Salcedo A., Resolution of Ternary Mixtures of Tartrazine. Sunset Yellow And Ponceau 4R by Derivative Spectrophotometric Ratio Spectrum-Zero Crossing Method In Commercial Foods, Talanta, 48: 933-942 (1998). Ni Y., Gang. X., Simultaneous Spectrophotometric Determination of Mixtures of Food Colorants, Analytica Chimica Acta, 354: 163- 171 (1997). Afkhami A., Sarlak N., Zarei A.R., Simultaneous Kinetic Spectrophotometric Determination of Cyanide and Thiocyanate Using the Partial Least Squares (PLS) Regression, Talanta, 71: 893-899 (2007). Lopez-de-Alba P.L., Wrobel-Kaczmarczyk K., Wrobel K., Lopez-Martinez L.,Hernandez J.A., Spectrophotometric Determination of Allura Red (R40) in Soft Drink Powders Using the Universal Calibration Matrix for Partial Least Squares Multivariate Method, Analytica Chimica Acta, 330: 19-29 (1996). Dinç E., Özdemir A., Baleanu D., Comparative Study of the Continuous Wavelet Transform, Derivative and Partial Least Squares Methods Applied to the Overlapping Spectra for the Simultaneous Quantitative Resolution of Ascorbic Acid and Acetylsalicylic Acid in Effervescent Tablets, Journal of Pharmaceutical and Biomedical Analysis, 37: 569-575 (2005). Hemmateenejad B., Akhond M., Samari F., A Comparative Study between PCR and PLS in Simultaneous Spectrophotometric Determination of Diphenylamine. Aniline and Phenol: Effect of Wavelength Selection, Spectrochimica Acta Part A. Molecular and Biomolecular Spectroscopy, 67: 958-965 (2007). Akhound M., Tashkhourian J., Hemmateenejad B., Simultaneous Determination of Ascorbic. Citric and Tartaric Acids by Potentiometric Titration with PLS Calibration, Journal of Analytical Chemistry, 61(8):804-808 (2006). Aktaş A.H., Yaşar. S., Potentiometric Titration of Some Hidroxylated Benzoic Acids and Cinnamic Acids by Artificial Neural Network Calibration, Acta Chim. Slovenica, 51: 273-282 (2004). Dinç E., Aktaş A.H., Üstündağ Ö., New Liquid Chromatography- Chemometric Approach for the Determination of Sunset Yellow and Tartrazine in Commercial Preparation, Journal of Aoac International, 88(6): 1748-1755 (2005). Dinç E., Özdemir A., Aksoy H., Üstündağ Ö., Baleanu. D., Chemometric Determination of Naproxen Sodium and Pseudoephedrine Hydrochloride in Tablets by HPLC, Chemical & Pharmaceutical Bulletin, 54(4): 415-421 (2006). Ni Y., Gong X., Simultaneous Spectrophotometric Determination of Mixtures of Food Colorants, Analytica Chimica Acta, 354 (1-3): 163-171 (1997). Rajalahti T., Kvalheim O.M., Multivariate Data Analysis In Pharmaceutics: A Tutorial Review, International Journal of Pharmaceutics, 417, 280-290 (2011). Zhang G., Pan J., Simultaneous Spectrophotometric Determination of Atrazine and Cyanazine by Chemometric Methods, Spectrochimica Acta Part A, 78: 238-242 (2011). Kumar N., Bansal A., Sarma G.S., Rawal R.K., Chemometrics Tools Used In Analytical Chemistry: A Overview, Talanta, 123: 186-199 (2014). Barimani S., Kleinebudde P., Evaluation Of In-Line Raman Data for End-Point Determination of a Coating Process: Comparison of Science-Based Calibration, PLS-Regression and Univariate Data Analysis, Europian Journal Of Pharmaceutics And Biopharmaceutics, 119” 28-35 (2017). Jalalvand A.R., Goicoechea H.C., Applications of Electrochemical Data Analysis by Multivariate Curve Resolution-Alternating Least Squares, Trends In Analytical Chemistry, 88” 134-166 (2017). Üstündağ Ö., Dinç E., Özdemir N., Tilkan M.G., Comparative Application of PLS and PCR Methods to Simultaneous Quantitative Estimation and Simultaneous Dissolution Test of Zidovudine-Lamivudine Tablets, Acta Chim.Slov., 62: 437-444 (2015). Aktaş A.H., Kitiş F., Spectrophotometric Simultaneous Determination of Caffeine and Paracetamol in Commercial Pharmaceutical by Principal Component Regression, Partial Least Squares and Artificial Neural Networks Chemometric Methods, Croatica Chemica Acta, 87(1): 69-74 (2014). Kenneth R.B., “Chemometrics: A Practical Guide”, John Wiley & Sons. Inc., New York (1998). Brereton R.C., "Applied Chemometrics for Scientists", John Wiley & Sons. Inc., New York (2007).